I’ve been trying to catch up on some UFOs I’ve had waiting to be finished for some time. I finished this wall hanging today. 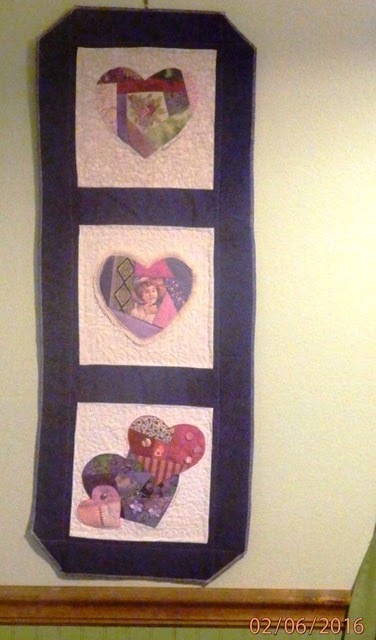 The heart blocks are made from members of the quilt guild I belong to. We use to have a block challenge each month, then in the next meeting we would all put our blocks in a bag and the person who’s block was picked won them all. These blocks are part of a bag full of blocks I won several years ago. Then I went through my hat box full of vintage, some antique and other blocks I’ve acquired over the years. 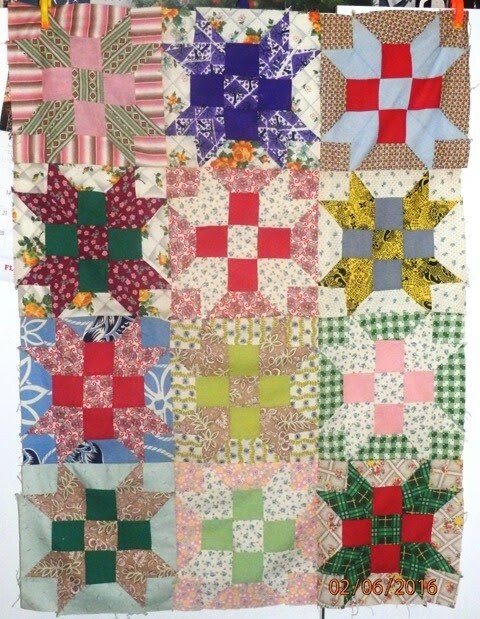 I found several “Farmer’s Daughter” quilt blocks. This pattern was an original pattern in the Kansas Star paper on March 20, 1935. The blocks I have are all hand pieced and scrappy, with a finished size of 10″. You can see by the fabrics they have been around for a while. I pieced them together to make a small quilt top. I trying to decide if I want to put borders on it or not. If I decide to, then I have to figure out what color to use… I’m leaning toward no border, just binding after I quilt it. If I just bind it, with no additional border, it will finish at 30″ X 40″.